A new Xbox One S is finally here! The new Xbox One S, called Xbox One S All-Digital Edition, is an Xbox One S but without the disc component just like the rumours that were floating around before had implied. 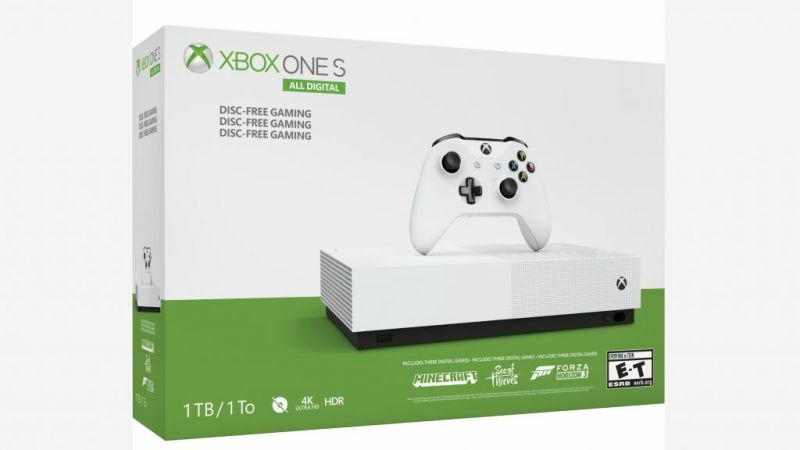 The cost of this latest Xbox One S will be $250, which is $50 cheaper than the standard Xbox One S.
The new All-Digital Edition is cheaper because Microsoft didn't have to add the disc compartment in the Xbox which also makes the manufacturing cheaper. The release date for this console will be on 7 May 2019. As implied by the name, the All-Digital Edition will only allow you to download games, TV shows, music and movies only digitally. You will also get three free games if you purchase the Xbox One S All-Digital Edition. These games are the racing game Forza Horizon 3, Mojang's open world Minecraft and the open world pirate adventure game Sea of Thieves. The digital versions of these games would cost you about $120 if you purhcased them all individually so the Bundle is a pretty great deal. All of these games have replayability and are quite timeless. Minecraft has been around for 10 years and still sees a lot of play. If you buy the Xbox One S All-Digital Edition, you will also get a special discount on Xbox Game Pass where you can pay just $1 for three months. Just like the Xbox One S, the All-Digital Edition will retain 4K HDR video streaming and game rendering. The All-Digital Edition is the 4th edition of the Xbox One console. You can pre-order the Xbox One S All-Digital Edition directly from Microsoft's Store. If you live in the United States, you can also pre-purchase the All-Digital Edition from retailers such as Amazon or Best Buy.